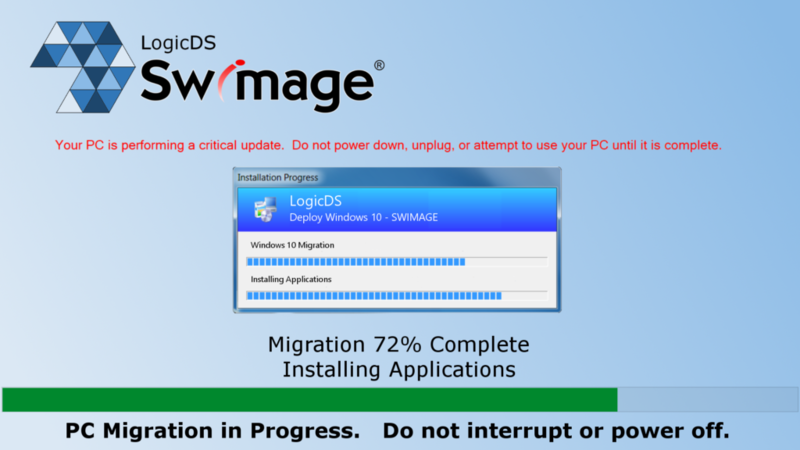 The Swimage Deployment SplashLock will lock the system during a migration to ensure no user can interrupt the process. During the migration, the keyboard and mouse are locked immediately, preventing anyone from accessing the system during the process. The SplashLock will also provide status and other messages during the migration so the user is not confused about what is happening. The SplashLock runs behind the Task Sequence as a service to ensure there can be no hijacking of the process under any circumstances. Once SplashLock is running on a PC, the system is completely locked out from any user input. During the processes, Shift-F10 will prompt for a password, which will allow for deployment techs to get access to the system for troubleshooting.